I am a Las Vegas native. I graduated from Valley High School in 1986, UNLV 1991 with a B.S. 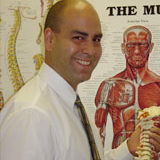 in Biology, and from Life Chiropractic University in 1997. Since 2000 I have had the privilege of working on various professional athletes, entertainers, and countless individuals here in our valley. When I am not taking care of patients I take care of one wonderful daughter, a curious little boy, and my wife takes care of me. If we are not enjoying the Vegas sunshine we are out on some beach somewhere.